Foster Underpass to get facelift – and you can participate Reviewed by Edgeville Buzz on May 30, 2009 . The Foster Avenue underpass will receive a mosaic as the third phase of the Bricolage project. This time around, Edgewater residents are invited to participate. Tonight at 7:30pm, Tracey Van Duinen and Todd Osborne will be projecting an image onto the Foster Ave underpass wall, and neighbors will be able to help trace the design. Later this summer the mosaic pieces will be applied to finish this piece of urban public art. Thanks to Anne Rossley’s blog for the info. 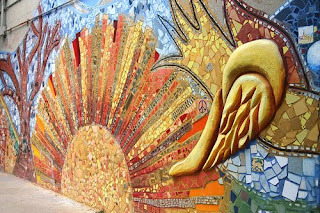 Check out the Bryn Mawr mural work in 2008.